When I was pregnant with Xavier I worried that I would not be able to love him as much as I did Isaac. How could I love anyone with the same intensity as my firstborn, my little buddy, my constant companion? We had been each other’s world for so long. What I had not been prepared for is that the all-encompassing love you feel when your first is born hits you all over again when your second enters the world. I had thought this love bomb had already been ignited when Isaac was born, but here was this intensity once again. The love you feel right to your bones and takes a hold of your soul. A thousand loves impacting you all at once. The only thing vaguely comparable is the obsessive love you feel in the first throes of a relationship when every thought is occupied by your crush. Take that feeling, deepen it and multiply it by a thousand and you still won’t come close. This is the all-consuming love that is born with your baby. Your first, your second, third, fourth – it doesn’t matter, that love remains just as powerful. Xavier became the centre of my world, just as surely as I was his. Everyone else just orbited the peripheral edges. Including my darling Isaac. He came to see us in the hospital. His three-year old body ridiculously large. His hands and feet preposterously enormous. 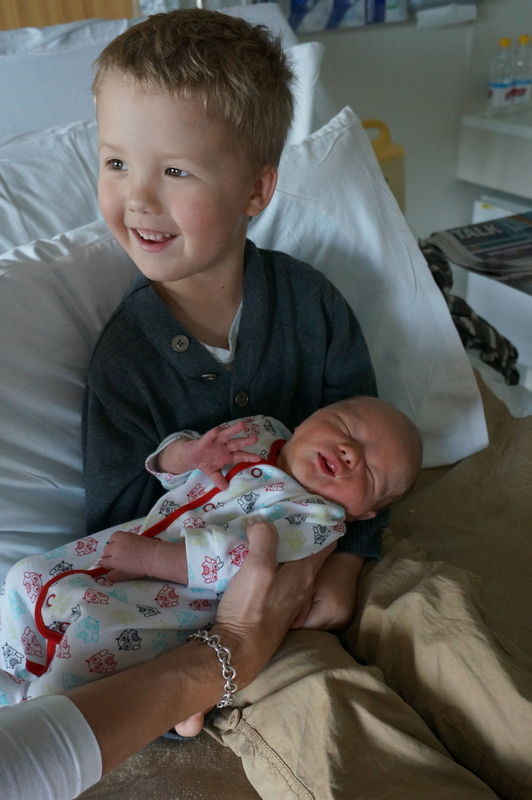 For a split second, as he shifted in my mind from baby to big brother, he seemed a stranger. I had not expected this. My heart expanded and swelled and there was more love for both of my boys. But my focus had shifted to the child who needed me more. When Elijah came into our lives I was prepared and I knew that my relationship with Isaac would change again. I also knew that my relationship with Xavier would change. 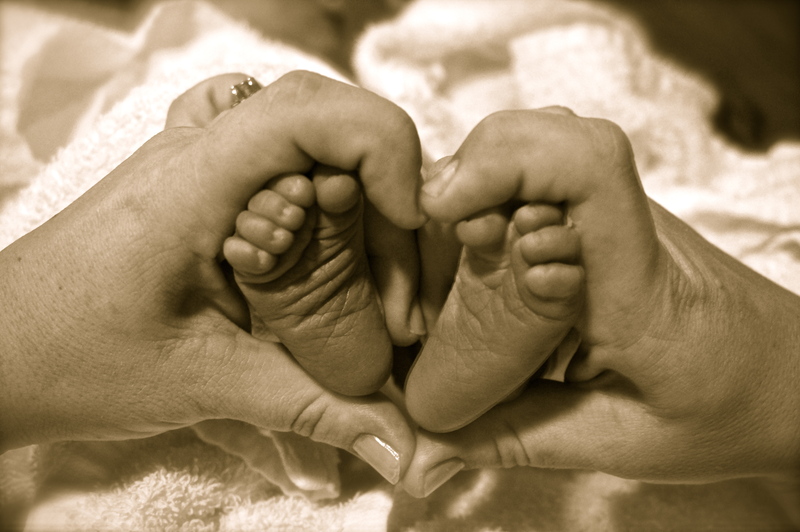 Early in grief I had decided not to relate to Xavier as a newborn – he had a different role in our lives. I disassociated pictures of infants from Xavier – I tried to avoid imagining what he would be doing as a baby and instead focused on the more abstract ways we experienced him. The sunshine, butterflies, nature’s beauty and the kindness of others. It was a way of protecting my heart. But when Elijah lay on my chest for the first time it was impossible not to think of Xavier. To remember what was and what might have been. But in that moment, I didn’t feel an aching sadness, I felt gratitude for this new life and Xavier’s part in protecting his little brother. My relationship with Xavier continues to shift and grow. My need for a baby in my arms has been soothed by Elijah. This portion of my grief – the fact a newborn was ripped from my arms like the severing of a limb, has been begun to be healed by littlest boy. But my need to still love and mother my middle child has not eased. The fact I miss just him remains – that has not lessened. My relationship with Xavier has become more uniquely about who he is and what he means to me, and less about regret for what we will have never have with him. The way I mother him will change accordingly. Each of my boys with their special place in my expanded heart. As my eldest son Isaac (now 4) grew from newborn to baby to toddler, I would announce each new phase as my favourite so far. But the newborn stage holds a special place in my heart. There is just something magical about new life in its most infant form. This tiny little person, full of possibility, but right now totally dependant. Baby at breast, surrounded by my family, offers a level of contentment that cannot be easily surpassed. Watching N hold little Elijah – both relaxing on the couch – fills me with warmth and gratitude. The little mewls, the grip of a tiny hand around your fingertip, those bewildered first glances until they catch your eye and gaze back your reflected love. The cuddles at all hours of the day and night. I can’t properly describe how much I love each moment. I felt this with Isaac, with Xavier and now with Elijah. When Xavier died so young, I felt particularly robbed of this beautiful stage. So I treasure every sight, every sound, every smell, every touch that Elijah offers. 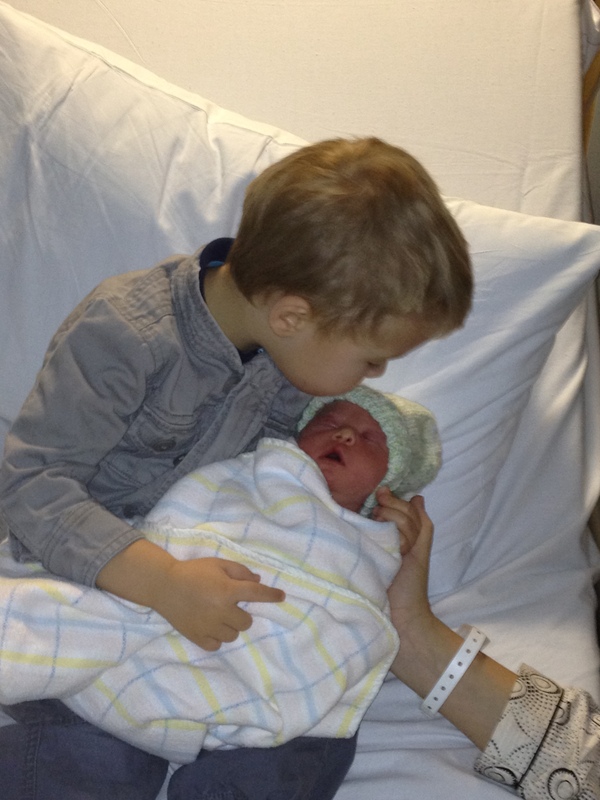 A dear friend gave birth to her first – a little girl- two days before Elijah came into the world. When we met up for the first time after our babies were born she cried with me over Xavier. Her absolute love for her daughter giving her a glimpse into what the impossible pain of losing Xavier might have been. Even now, with Elijah in my arms, I wonder how I survived – and continue to survive – without one of my children. But his love remains and my heart richer for him being a part of our lives. I am a better, more patient and more grateful parent after loss. And the magic of a newborn has me spellbound once again.